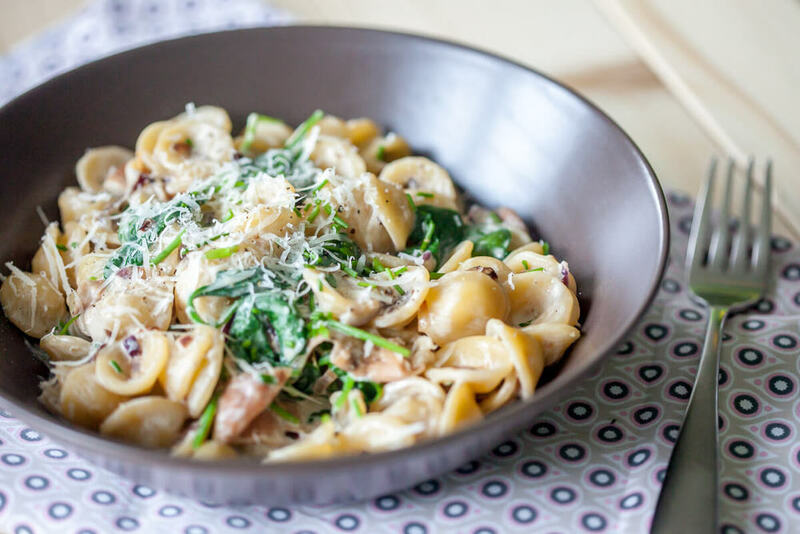 Spinach is a controversial vegetable in our household, but I love this easy &creamy spinach orecchiette pasta with young spinach leaves and Parmigiano. Pour water in a pot and add a pinch of salt. Bring water to a boil, then add your pasta. Cook according package instructions until "al dente" (cooked through, but still firm in the middle when you chew it). When cooked, set aside a cup of pasta water and then drain the pasta. Peel your onion and garlic cloves and finelly chop. Give your spinach a wash and drain it. In a pan, heat olive oil, then add chopped onions and garlic. Stir occasionally until tender and translucent. Add cooking cream and stir into the onions, then add the drained pasta and spinach leaves and combine well. If the pasta is too thick, add a drizzle of pasta water to reduce the thickness. Salt & pepper to taste. Serve your pasta with grated Parmigiano cheese and a sprinkle of fresh chopped chives.